Fulton Sheen delivers prophetic sermon on the Antichrist, the signs of our times, the apocalypse, a coming chastisement, and gives three practical suggestions for Christians of this age. The audio has been cleaned and remastered from the original radio program “Light Your Lamps” entitled “Signs of Our Times” broadcast on January 26, 1947. Some quotes: – Venerable Archbishop Fulton J. Sheen: “Only those who live by faith really know what is happening in the world.” “The battle lines are being clearly drawn and the basic issues are no longer in doubt. “He (the Antichrist) will come disguised as the Great Humanitarian; he will talk peace, prosperity and plenty not as means to lead us to God, but as ends in themselves.” “Evil catastrophe must come to reject us, to despise us, to hate us, to persecute us, and then, then we shall we define our loyalties, affirm our fidelities and state on whose side we stand. 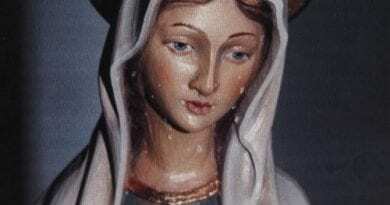 ← Ave Maria in Medjugorje…There are many powerful demonic forces attacking America right now… There is only ONE remedy – It is Our Lady’s Immaculate Heart. See the power and the hope in this video.